Costa Rica was a pioneer of the concept of ecotourism more than 30 years ago. The idea is that you travel to this little Central American gem to enjoy nature in all its forms: hiking through the rainforest, craning your neck to glimpse three-toed sloths hidden in the canopy…bird watching for the resplendent quetzal in the cloud forest…observing thousands of sea turtles lay eggs on a beach at the same time…or spotting humpback whales just off the southern Pacific Coast. As one of the most bio-diverse spots in the world—it has 6% of the world’s species despite having only 0.03% of the landmass—Costa Rica continues to be an ecotourism leader. In fact, 25% of its territory is national park or private reserve…and nearly 100% of its electricity is generated by renewable sources like hydroelectric and wind power. And if you’d prefer to stay at a big resort with loungers and umbrellas on the beach…or rent a villa with your whole family in a lively beach town and go out to dinner and drinks (and then dancing all night)—you can do that too. 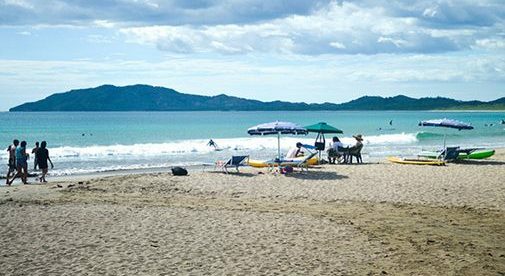 The point is that Costa Rica is an ideal vacation destination no matter what you like to do. Thrill-seekers, nature lovers, beach bums, resort-goers, and more have options throughout the country. The numbers bear it out. Tourism has steadily increased here over the years. According to statistics from the tourism board, in 2017 there were just under 2.2 million visitors who came to Costa through its two international airports, with about half of those tourists coming from the U.S. That’s up from 1.7 million in 2014. Tourism is a major driver of Costa Rica’s economy. And many expats are right in the thick of it, starting a wide range of businesses serving the tourist market. The sky is the limit as far as what you can do. In my time in Costa Rica, I met many expat business owners—in fact, I counted many of them as friends. They have thriving ventures like sports bars, beach bars, coffee shops, flower shops, tour companies, vacation rental management, surf schools, coffee farms, sport fishing charters, souvenir shops, art galleries, smoothie shops, organic produce markets, jewelry shops, taco food trucks…the list goes on. With lower start-up costs, lower operating costs, and a steady market of tourists (not to mention a stable population of expats who can become some of your best customers), starting a business in Costa Rica catering to tourism is worth a closer look. You could start fresh or buy an existing business. The key is to get to the know the community you want to live in. Spend six months getting the lay of the land, meet expats, chat with visitors…figure out what is lacking in a certain location—what do people want—then give it to them with your new business.